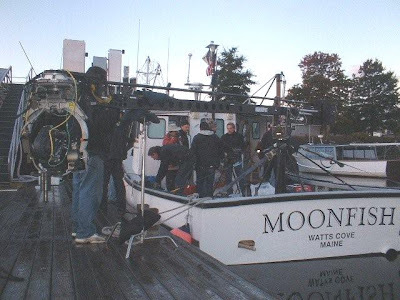 This photo was taken by Moonfish crewman DL Maxcy on Friday, October 17th just before we got underway for a shoot off Mt. Desert Island's Otter Cliffs. Camera Crane is an Enlouva with a 15' extension. I had to lighten the image a little on account of the fact that the shot was taken in low light at about 6:00 AM. That's Ron Ames in the hat and Robert Legato to his left. I believe Bill Summers is the one with his back to the camera. The other people in the photo are all members of the film's Second Unit Team and/or Camera Dept.